Graphic Arts from the Chester Dale Collection, National Gallery of Art, Washington, 1965. Miss Mary Cassatt: Paintings and Graphic Arts, Parrish Art Museum, Southampton, NY, 1967. 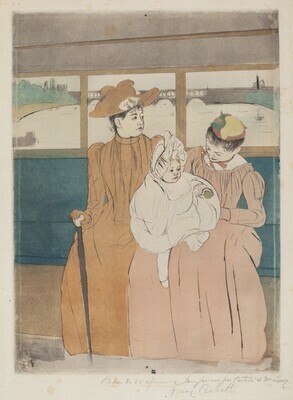 Mary Cassatt, 1844-1925, National Gallery of Art, Washington, 1970. Mary Cassatt: Modern Woman, The Art Institute of Chicago; Museum of Fine Arts, Boston; National Gallery of Art, Washington, 1998-1999, no. 58, as Interior of a Tramway Passing a Bridge (shown only in Washington). Mary Cassatt, National Gallery of Art, Washington, 1999. Breeskin, Adelyn Dohme. Mary Cassatt: A Catalogue Raisonné of the Graphic Work. Washington, DC: Smithsonian Institution Press, 1979, no. 145, iv/iv. Mathews, Nancy Mowll, and Barbara Stern Shapiro. Mary Cassatt: The Color Prints. New York: Harry N. Abrams, 1989, no. 7, vii/vii. Grieder, Terence. Artist and Audience. New York, 1996: 444, fig. 13.22. Mary Cassatt: Modern Woman. Exh. cat. The Art Institute of Chicago; Museum of Fine Arts, Boston; National Gallery of Art, Washington, 1998-1999: 83-84, no. 58.